The following post was shared with the CopBlock Network anonymously, via the CopBlock Submissions Page. It refers to the killing of a mentally disabled man by four police officers in Fairfax County, Virgina after he had wandered away from a group home in April of this year. (Note: This case was discussed in an earlier post by CopBlock Network Contributor Lorelei McFly of Virginia CopBlock. Lorelei’s mention of the incident was included within a larger and more general post about issues within Fairfax County. Chief of Police: Colonel Edwin C. Roessler Jr.
Paul Gianelos was a 45 year old man that suffered from severe autism to the point that he was non-verbal, as well as unspecified physical disabilities. As a result of his mental and physical disabilities he was living in a group home. On April 2oth, he wandered away from that home. In spite of the fact that he apparently (according to Lorelei McFly’s previous post) had suffered some sort of injury during a previous interaction with police, the group leader at “St. John’s Community Services” in Annandale called 911 once he realized Gianelos was gone during an outing at Round Tree Park in Park Falls. Although it’s unclear exactly what happened or why, Master Police Officer (MPO) Michael Meszaros attempted to take Gianelos into custody after he found him nearby. The other three officers soon joined in that attempt and at some point Gianelos suffered a head injury (described by police as a “scrape”). According to Fairfax County Police Chief Col. Edwin Roessler, he then suffered a “medical emergency” and was rushed to the hospital where he was declared dead upon arrival. An officer found Gianelos about a mile and a half away from the park and asked for the caregiver to meet them, police said. While waiting for the caregiver, police said Gianelos became combative. Four officers restrained him and handcuffed him behind his back. In the struggle, Gianelos’ forehead was scraped. Police said Gianelos was 5-foot-9 and about 280 pounds. He experienced a medical emergency while the officers tried to take him into custody, police said. Fairfax County Police Chief Col. Edwin Roessler said Gianelos was alert and breathing when police called paramedics. When a crew arrived, Gianelos suffered what appeared to be cardiac arrest, police said. A medic performed CPR on Gianelos while he was rushed to Inova Fairfax Hospital, police said. Gianelos did not survive and was declared dead soon after he arrived at the hospital, police said. One of the many issues with police is the way that they often treat people suffering medical episodes, especially those that are mentally ill and/or developmentally disabled, as law enforcement issues rather than medical emergencies. This is yet another case of why the police should not be the ones you call when someone needs medical assistance. Nor should it be shocking that a man who has already been injured during a previous interaction with police might be reluctant to allow himself to be taken into custody and confined within a police vehicle. A video (embedded below) posted by wusa9.com, another local news sation, questions that decision by the group home and the resulting actions toward Gianelos by the police. In that video, they question why police were trying to take him into custody in the first place. 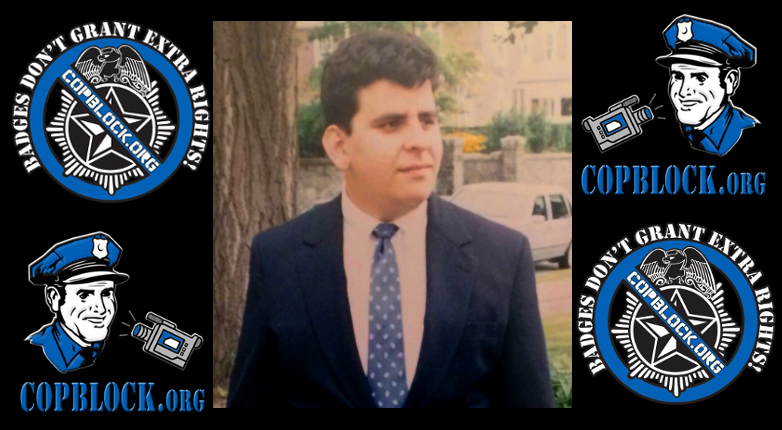 They also question whether the police officers involved were properly made aware of the circumstances and of the issues relating to Gianelos’ disabilities and verbal limitations. Remember, when you call the police for help with a medical issue you may be sentencing that person (or yourself) to death. They are not doctors or paramedics and they often do not have the proper training to deal with mentally disabled people. What they do know and insist upon, often violently, is compliance.